Long before the megachurch, nearly 6,000 people crowded every service to hear Charles Spurgeon. Billy Graham has wonderfully described Charles Spurgeon as a preacher who extolled Jesus Christ - everlasting! Yet he related his message to the practical needs of his listeners. It is little wonder that no building seemed big enough to house all those who wanted to hear Spurgeon preach. 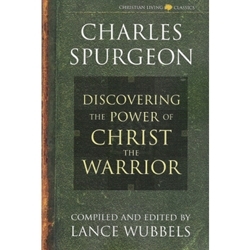 Spurgeon particularly loved to extol Jesus Christ as the Almighty Warrior who has conquered every spiritual foe and who reigns as King over every realm in heaven, earth, and hell. How powerfully he speaks of the authority with which Christ takes the keys of death and hell, of Christ as the liberator of believers from the power of sin, of Christ as the destroyer of Satan and death, of Christ as the mighty Savior who ominpotently leads His Church, of Christ as the Lamb of Revelation who takes the sealed book and opens the secrets of God, and of Christ the rider of the white horse who will return to earth to set up His eternal kingdom.